Valves & Vixens 3 is released today! 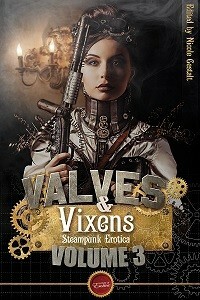 Valves & Vixens is a collection of steampunk erotica published by House of Erotica. My contribution, FLIGHT AND FANCY, is a 13k gaslamp m/m short, set in Newcastle, UK, mid-nineteenth century. Thomas Whitlock needs a stall at the Ascension Day market if he’s going to make enough money to leave Newcastle for the south. When his latest negotiations with costermongers fail to produce anything but animosity, Thomas permits himself an evening to forget his troubles—only to find a different sort of trouble when he meets Smythe. A creature of the travelling night market, compelling and enigmatic, Smythe draws Thomas to him despite his misgivings. Will Thomas be able to resist Smythe and salvage his reputation? Or, like his clockwork contraptions, will Thomas’s desire take on a life of its own?